New York: Action Play-books Inc., (1945). ￥4,000 (税込み) 19.3 x 16.5 cm. 32 pp., fully illustrated in color and b/w. 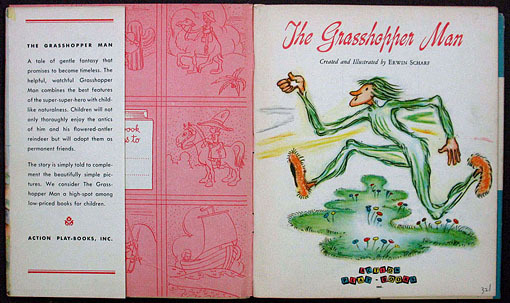 Original cloth-backed pictorial boards, with original dust jacket slightly chipped. A unique fantasy starring a new superhero: Grasshopper Man.